with three supporting acts led by individual boys. In the first half tenor William Salmon started with his rendition of Ol' Man River before returning to his Scottish roots to sing The day we went to Rothesay oh! (which gave all those present a chance to join in the chorus) and the modern song The Black Island based on the theme tune of a Scottish TV soap opera. We are used to Grayson Pattemore springing a surprise or two. Tonight's entertainment was notable for a mobile phone call from the 95 year old American songwriter Tom Lehrer reminding Grayson of the final words of his 'Periodical Table' sung by Grayson with his usual aplomb and by him finishing off the final two verses of 'Paddy's Not at Work Today' during supper in the Village Hall! During the interval we enjoyed the short walk on a warm evening lit by a full moon to the lovely Village Hall to enjoy a generous buffet and hot drinks. Here we were reminded of Grayson's background as he lived locally for many years and featured on the numerous posters of the annual Music Hall nights held here. As if he needed an excuse he was able to interrupt the start of the draw with his finale (see above). 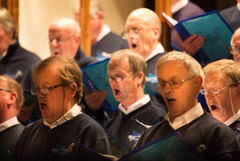 In between our five second half songs, Roger White sang three songs accompanied by fellow Brue Boy Nick Llewellyn and guest Mick Little shown in the photo left. The three songs: 'Streets of London', 'Fiddler's Green' and 'Donna' gave us all the chance to join in with the chorus. 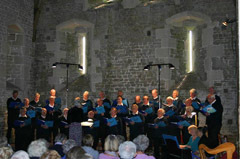 Our final concert of the 2012/13 season was held on Saturday 20th July in St Nicholas' Church West Pennard. 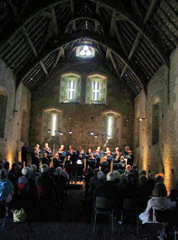 It was a welcome return to West Pennard, the home village of several choir members, but the first in the beautiful Church. 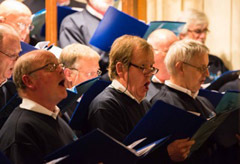 The Brue Boys sang a varied repertoire of thirteen songs including Amen (This Little Light of Mine) , I Believe and Sweet Lass of Richmond Hill, for the first time. Counter-tenor Mitchell Brine sang three songs ( Now sleeps the crimson petal, My dearest dear and We'll gather lilacs) in his distinctive style. Grayson Pattemore again excelled with his immaculate timed monologue celebrating his SATNAV (supported by Eleanor alias Grayson's SATNAV) and Paddy's hilarious sick note performed in song. Roger White with Alan Moody and Nick Llewellyn sang The Ballad of Seth Davy, On Raglan Road and Donna, Donna to give the large audience a chance to join in. 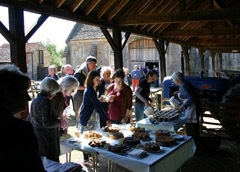 The concert made a profit of £II60.60 towards a Church Roof appeal following a recent theft of lead. The Boys were most impressed with the excellent refreshments and thank the West Pennard Community for inviting us to help them in their fund raising on this hot summer's evening. 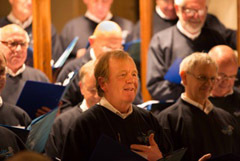 to perform at the 150th show. 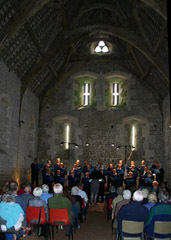 The Brue Boys provided a concert held in the Tithe Barn at the Glastonbury Rural Life Museum on the afternoon of Saturday 18th May. 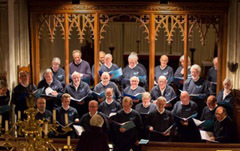 Introduced by the Chairman of the Friends of the RLM (and Brue Boy) David Heeley, the concert raised funds for a major museum refurbishment scheduled for 2014. 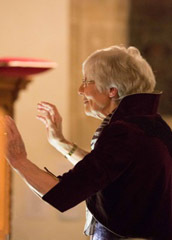 The choir was conducted by the Brue Boys Musical Director Jennifer Martin and accompanied by Carolyn Young. 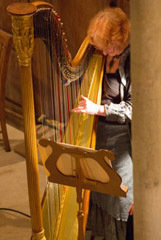 Carolyn played the harp and sang with Gail Cornish the songs 'the Silver Wheat' and 'Bread and Fishes'. Paul Oddie made a humorous Brue Boys CV entitled Lies, damned lies and statistics which summed us all up with great aplomb. including a new version of 'Stand By Me' and some old favourites including Waltzing Matilda, Unchained Melody and Alexander's Ragtime Band. and another new venue to add to our list. 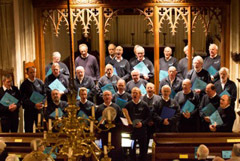 On a chilly March 9th the Boys travelled to East Pennard to perform in All Saints’ Church to help to raise funds to repair the roof whose lead had been stolen last year following a very expensive renovation. 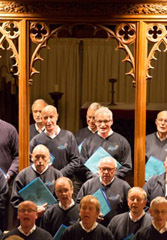 Two new songs; Unchained Melody, and Bobby Shafto, were performed by the choir for the first time in addition to eleven further pieces including a resurrected Kumbaya, The Rose (always popular with the Boys), Aberystwyth (much loved by Jennifer), and the rousing When the Saints go Marching in. 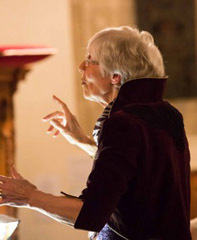 Carolyn, the choir’s accompanist, took up her harp to accompany Gail Cornish in a haunting rendering of the Welsh folk song Bugeilio’r Gwenith Gwyn (Tending the White Wheat) which tells a tale of thwarted love. 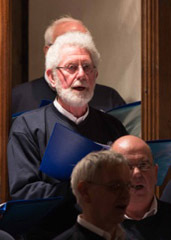 The newly discovered talent, William Salmon from the Choir’s Tenor 2 section, sang beautifully two Scottish folk songs;The Dark Island, and Down the Glen, rounding off his superb contribution with The Day We Went to Rothesay O with the keen participation of the audience. 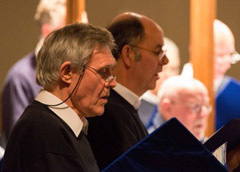 A final contribution was made by two members of the bass section; Nick Llewellyn (guitar), and Roger White (vocal), assisted by Lisa Thomas (whistle, antique Salvation Army concertina, and mouth organ), and Alan Moody (lead guitar), who performed two folk songs (Sweet Nightingale, and Fiddler’s Green) and a converted hymn “Only Remembered” all with the help of the audience. Carolyn playing her harp to accompany Gail singing "Bugeilio’r gwenith gwyn ". 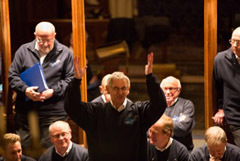 Centre : William Salmon invited the audience to join in with the chorus of “The day we went to Rothesay - O"